The moderate would never swing to the far left or to the far right because it understood the importance of putting the country first, before political ideology and ahead of party loyalty. This mentality was what has kept our country together throughout the toughest times that we have had to face. This country has thrived because of its ability to come together during times of tremendous adversity. Many of those times it was the moderate began the dialogue. Because the majority of our country's citizens would likely be considerate moderate, we never felt as though too much of one ideology was being pushed to the forefront of the debate or that one side was being completely ignored despite it's opposition. Unfortunately it seems as if we have reached a point in American politics where the moderate has ceased to exist. There is no voice of reason. Our government has turned into a bunch rabid fanatics, who can't here or see beyond their own latest talking point. Each party has become an extreme version of itself and has completely isolated the other side. The amount of anger, bitterness and resentment that has arisen within our political landscape is unprecedented. Granted much of this animosity can be attributed to the likes of such characters as Rush Limbaugh, Sarah Palin and Glenn Beck. These classic antagonists have helped to create dissension between the parties with their insults and extreme, right wing rhetoric. A cloud of dissension that has made it impossible for our two main political parties to come together on virtually any decision. This has not only handicapped our country tremendously, it has made former colleagues who could once argue and debate one minute and have a beer the next, enemies. 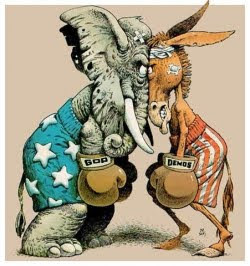 Many Americans have lost faith in the political process, because all they see are two political parties fighting to see who's man meat gripe is bigger and who can yell foul the loudest. The Republicans drew first blood though. Once President Obama began his term in office he faced immediate opposition and scrutiny on every decision he made, primarily by the GOP. President Obama’s big spending seemed to be at the forefront of the witch-hunt. Then came the rise of the Tea Party movement, also outraged at President Obama’s desire to use government funds to help resuscitate our failing economy. Some nerve. Our question to the GOP is and has always been, "where were you when Bush was using government funds as his own personal piggy bank?" In retrospect the Bush era began this extreme political banter. During the eight years Bush was in office and the GOP had control of the House and Senate, his agenda was steam rolled on through and there wasn't a thing a Democrat could do about it. His bad decisions and the Democrat's inability to act, undoubtedly began the bitterness between the two parties. The GOP is already looking beyond November and it's chances at regaining control as an opportunity to "take back their country." There seems to be no plans on the horizon to heal the wounds of the past and to abolish the tension that exists. Has government been less effective over the last few years because of the tensions between the two parties? How do we bring back the voice of the moderate in the midst of such a bitter political climate? We want to here from you. Please share your comments and thoughts below.